The analysis of nucleic acid markers that reflects similarities in DNA or RNA sequences (DNA or RNA fingerprinting) has become widespread, and has many uses, including identifying progenitors, siblings or paternity, establishing identity of target recovered from different locations, assessing population structure including clonality or degree of recombination, predicting phenotypes, etc. Factors influencing the choice of a fingerprinting technique include the type of application, the target organism under investigation (animal, plant, microorganism), the source of target material available, the resources and skill base to perform tests, and the availability of data for comparative analysis. Ideally, the method should be cheap, rapid, reproducible, discriminatory, independent of other methods, and applicable to all types of samples including to targets without prior sequence or genetic mapping information. Moreover, the method should be amenable to automation, easy to interpret and standardize between different testing sites, capable of comparisons with different methods, and require minimal molecular skills from the operators and those interpreting the data. Currently, no single technique is able to meet all of these requirements. 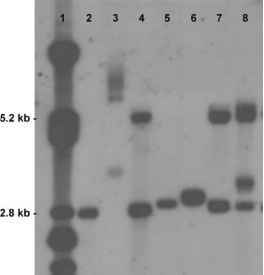 Southern blotting followed by probing with labeled nucleotides such as is required for ribotyping or insertion sequence typing (IST). Most importantly, AFLP markers have a high multiplex ratio (the number of different genetic loci simultaneously analyzed per experiment) that allows characterization of, at least in part, the entire genome. In contrast, assays characterizing single loci have a multiplex ratio of 1.